Supreme Court today asked bar bodies to come forward and suggest ways to fine-tune the method of designating lawyers as ‘senior’ advocates and also assist in evolving firm criteria for the exercise. 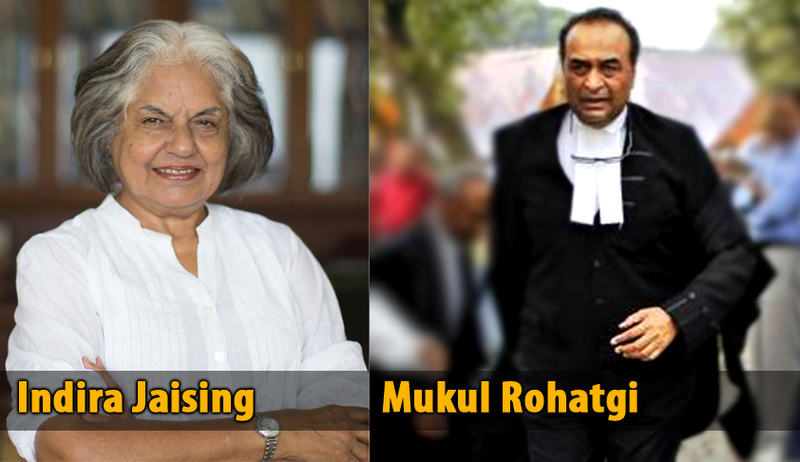 Appointing Attorney General Mukul Rohatgi as amicus curiae to hear the petition filed by senior lawyer and former Additional Solicitor General Indira Jaising seeking a judicial scrutiny of the process adopted by the apex court while appointing lawyers as senior advocates, a bench of justice T S Thakur and justice V Gopala Gowda said “Bar members may tell us the correct way to do it if there are discrepancies”. Jaising has termed the present process as opaque, arbitrary and fraught with nepotism. “Is there any criteria for it ? If there is no criteria, then what can be done”, you all shall sit together and decide. Let the Bar be not divided. Sit together and evolve a consensus. The Attorney General may take various shades of opinion and file a response”, Justice Thakur told AG Mukul Rohatgi who has been asked to hold consultations with Bar Council of India, the apex regulatory body of lawyers, Supreme Court Bar Association and Supreme Court Advocates-on-Record Association.The AG has been asked to file his response within six weeks. On the last date of hearing on July 24, justice Thakur sought to dispel the impression among legal fraternity that lobbying with judges plays a pivotal role in designating a lawyer as a senior advocate.The apex court, at the same time, said there is a need for uniform rules across the country in designating senior advocates. "We ensure that among judges there have never been in the Supreme Court any lobbying. People here who are judges have come from various parts of the country and there have been no intention pulling anybody down or pushing anybody up," said justice Thakur. However he conceded that "there appears to be general disenchantment among the members of the Bar on the issue" and "there is a need for rules, something that can be applied uniformly to all high courts in designating senior advocates". During the hearing, Jaising got support from other senior advocates like Kapil Sibal, Vivek Tankha, Rajiv Dhavan, M N Krishnamani and others, who in one voice said transparency was lacking in designating lawyers as senior advocates and there was a need to take corrective measures. The Bench, which in the beginning tried to persuade Jaising by saying that the prevailing system was applied for designating her as senior advocate at a relatively younger age in 1986 and she never had any grievances, decided to examine the issue after she got support from other senior lawyers. Jaising has virtually questioned the apex court's fairness in selecting lawyers for the 'senior advocate' designation. The provocation for her filing the petition after writing a letter to the Chief Justice of India, all judges and eminent advocates including the bar bodies was the SC's April 23 decision to designate five out of 14 applicants as 'senior advocates'. Some of the new designates sparked 'wild gossip' in the court's crowded corridors. "Out of 14 candidates who had recommendations from not less than five judges, only five have been selected for designation with nothing to indicate why the others were not designated. Each of the five advocates (who are designated) is a general practitioner. Advocates with PIL background and domain expertise have been totally left out," Jaising said, complaining about bias in the selection process. "There seems to be an unwritten bias against lawyers who do PIL in environmental law or human rights law cases and those who have domain expertise in specialized subjects such as international arbitration, inter-state water disputes, cyber law etc," she alleged. She requested the CJI and judges of the Supreme Court to constitute a "search committee of judges" to identify those lawyers doing PIL work in environmental law or human rights and those lawyers having domain expertise for designation as 'senior advocates'. Explaining her pro bono role in the issue, Jaising says, "I have no vested interest in the issue having been designated way back in 1986 by my own high court and I am justly proud of the fact that I was indeed the first women to be designated by the High Court of Bombay."